Don't let your fishing plans get blown away by a blustery spring in the Coastal Bend - there are options. Years ago I did a piece on fishing windy conditions in the Coastal Bend. general angling audience then surely it would be helpful to newcomers unaccustomed to fishing such apparently difficult conditions. I entered this challenge somewhat naive, being relatively new to Coastal Bend fishing myself at the time. But once on the bay I was carefree flinging live shrimp great distances with the aid of wind at my back and that now familiar orange and green Alameda Rattling Float. From the deck of a bay boat, which was held to a pace considerably slower than the wind speed by dual drift socks, we enjoyed brisk trout action while sailing through the day on a 25-mph breeze. This past week, Aaron Loomis demonstrated a different tact during relentless winds, which I'm told gusted up to 33 mph on the day we waded and drifted a Laguna Madre tide. I forgot to mention earlier that I had received a severe scolding from a reader who read my original column on windy fishing. go fishing? Could I have inadvertently lured anglers into harm's way? Probably not. After numerous conversations with local anglers and guides my conscience began to clear. Though I admit now there were lessons to be learned, the prevailing view remains that a small craft advisory - which are issued for our bays when sustained winds are predicted to be or measured at 18-33 knots - is not necessarily reason to cancel a boat-fishing trip. Exceptions to this general rule involve many factors though. I should have listed these before. My incomplete list includes such items as the type and size of your vessel, the experience level or age of passengers, the captain's experience and familiarity with local waters, and the wind direction as it relates to the location of your launch site or destination. Consider each of these when planning a voyage. If wind speeds are expected to exceed 20 mph, especially when stronger gusts are predicted, consider fishing another day if you plan to paddle a kayak or use a small motor-powered aluminum craft in deep, unprotected or unfamiliar waters. To state the obvious, also consider the probability of thunderstorms. With sufficient disclaimers out of the way, I can tell you now how one local Laguna Madre angler laughs at a typical windy day in the Coastal Bend. Aaron Loomis is an efficient angler who usually catches fish without wasting time or fuel. He's the Causeway Kid, finding much of his angling success in the shadow of the JFK Causeway. But this day we ventured down the Intracoastal Waterway maybe 15 or 18 miles south of Marker 37 Marina before stopping. We anchored on a vast no-name seagrass flat east of the ICW. Lots of floaters are there and we were no spoil islands nearby, which meant our position was completely unprotected from a hard southeast wind. I probably would not have stopped here to fish and I suspect many of you also would have passed it by. Baitfish activity can go undetected in that kind of wind. Fishes, mostly small ones, tend to avoid surface churn for the same reasons most of us, excluding surfers and reporters, avoid hurricanes. Most of you know that when an intrepid mullet does break the surface during windy conditions or when an airborne baitfish reenters a choppy bay, it's easy to spot the windblown splash from a great distance. But even when mullet are not evident, who's to say perch are not sheltered below in the seagrass. Bait is bait. From the boat I could see a thick carpet of seagrass through a transparent waist-deep tide. Many bay bottoms of the Coastal Bend sport adequate vegetation to maintain water clarity during a stiff breeze. Find these and fish them. Once out of the boat, high winds seem more tolerable, compared with the exposure of standing on a deck. At least this was true during the time it took for us to wade about 300 yards of a flat with semi-firm footing. 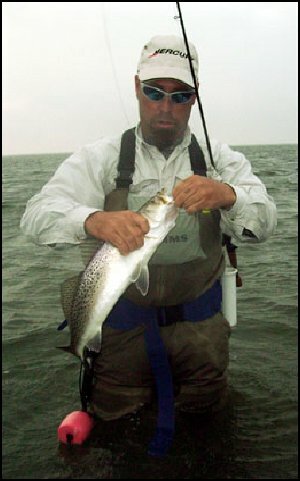 It helped that we were catching trout and redfish with topwater plugs during most of this wade. A somewhat established rule that big plugs work best in a big chop didn't work for us. Loomis used a Super Spook Jr. and I switched from a larger He Dog to the smallest Skitterwalk. I can't explain why fish virtually ignored my larger plug and keyed in on smaller lures. Probably had something to do with what the fish were eating. Anyway, we eventually switched to soft plastics and continued to catch fish. For some reason, we experienced lots of mishits. Could have been really big perch. I ended the wade with a Bass Assassin shrimp imitation called a Shrimp Cocktail. These come with a weighted-shank hook that can be rigged weedless. I got fewer mishits with this lure. Our next stop was an area we had passed earlier. The backside of Padre Island features some of the most attractive fishing waters that are routinely ignored. An apron of hard yellow sand stretches along much of the island. And at the end of this irregular fringe is a dramatic drop-off that parallels the shore. It's easy to spot the depth change because it's clearly marked by dark seagrass. Too often, boaters skirt this line as if it was a highway, but Loomis said he's noticed more and more boats maintaining greater distances from it. During our prevailing wind, it's an easy wade on sand while casting into the seagrass. Just pick a stretch and head north. Even in a really stiff wind you'll feel as though you're in the eye of a storm with the island dunes blocking wind at your back. When you're done, walk to the island and hike the beach back to the boat. We picked up several more fish here, mostly using soft plastics and targeting the potholes. Lots of mullet along this shore. If you hit feeding time - which likely occurs in the afternoon or at night - watch out. Be warned, though: ladyfish (skipjack) roam these waters. Around noon, Loomis said he had one more windy-day option to explore. For this one, you can stay in the boat. It's a little too deep for wading. Most everyone recognizes the old Barney Davis Power Plant in Flour Bluff. It's easily visible from the lagoon. From our next fishing spot, the plant was directly west of us in the distance. We drifted another seagrass meadow east of the ICW. Anglers familiar with this huge flat know it's nearly always good for a few redfish and maybe trout. It's so vast, though, that many anglers make the mistake of abandoning their drift before discovering what it has to offer. Loomis explained that rarely are fish scattered evenly throughout this flat. He's found singles within isolated clusters of potholes or small schools rooting through the grass in several sections of the flat. They cannot be everywhere. It's too large of an area. Within an hour's time without the aid of a drift sock, we - and I use this term in the most liberal sense - caught and released a half-dozen redfish and several trout, all on soft plastics. And then the rain came. No lightning though. But by this time our return boat ride to Marker 37 was brief. The following day was calm, of course.